"The Kiev authorities' attempts to garner the BlackSeaFor member-countries' support for its anti-Russian initiative failed. No BlackSeaFor state has upheld this initiative," the source told ITAR-TASS on Friday. “From May to June the Ukrainian authorities were sending their envoys to Bulgaria, Romania, Turkey and Georgia for holding talks with their military and political leaders. Ukraine’s staff in Sofia, Bucharest, Ankara and Tbilisi were running around government offices. However, the attempts were vain,” it said. “The BlackSeaFor countries’ position was to preserve status quo, i.e. the existing format with Russia’s participation. Ukraine was informed about the BlackSeaFor member-states’ view to freeze the organisation’s activity until the situation in Ukraine normalises,” the source said. 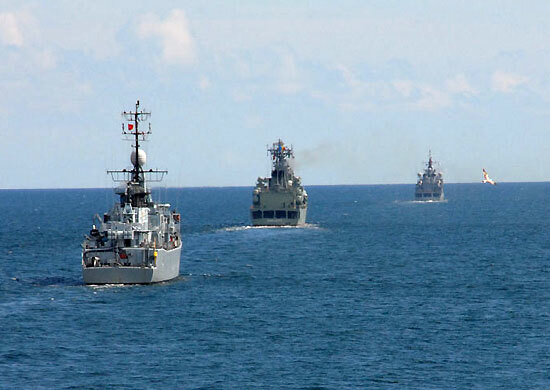 BlackSeaFor was formed in 2001 with all of the Black Sea littoral countries to carry out regular joint exercises with the aim of improving the interoperability of the various navies. The exercises generally focused on search and rescue, humanitarian assistance, mine counter measures, chemical/biological/radiological/nuclear defense and peace support operations, wrote Russian military analyst Dmitry Gorenburg in a 2011 assessment of BlackSeaFor. And for its modest aims, it was largely successful, Gorenburg concluded: "BlackSeaFor has played an important role in increasing interaction among the Black Sea littoral states’ navies. However, its operations and exercises have generally been limited to a fairly basic level, both because of the limited tasks delineated in the political agreement on the force and because of the poor condition of most of the member states’ naval forces." The program even managed to survive the 2008 war between Georgia and Russia; Georgia suspended its participation briefly but by 2011 had again sent a ship to participate in a BlackSeaFor exercise. "BlackSeaFor thus becomes the only venue where Russian and Georgian military units have to communicate and work together. This can only be seen as a positive step for long-term regional security and understanding," Gorenburg wrote. Oksana Antonenko, from the International Institute for Strategic Studies in London, argues that Turkey and Russia, the Black Sea’s historical great powers, have been unable to overcome their “mutual skepticism towards the role of the U.S. in the Black Sea [and this] has made it difficult to accommodate the interests of smaller states that view the U.S. role as an indispensable instrument for overcoming the strategic asymmetry in the region and balancing their power in relation to the two regional great powers.” In other words, smaller states like Romania, Bulgaria and even Georgia itself saw the U.S. as a crucial non-regional ally to balance the ambitions from both Ankara (a fellow NATO ally of Bucharest and Sofia) and Moscow. Although Turkey has been pretty quiet about events on the Black Sea, it seems likely that the tension that Sanchez described has only become more acute in the last few months as the U.S. and NATO have substantially increased its naval presence on the Black Sea. Russia, of course, has not been quiet about that, and it's pretty hard to imagine them taking part in naval exercises with Ukraine and a bunch of NATO countries. So the main result of Moscow's diplomatic victory in staying in BlackSeaFor would seem to be the organization's becoming completely unworkable.